The EVERDURE CALTITE System was released in 1960, after an almost ten year research and development period. During this time, the primary moisture transport systems in concrete were examined and identified, along with the reasons for the disappointing performance of previous so-called “water-proofing” admixtures. The System was originally developed for membrane-free waterproofing of concrete basements, roofs, swimming pools and other water retaining structures. Because water is a required component in almost all types of concrete corrosion, it was soon proven to have particular application in aggressive salt , chemical, industrial and agricultural environments, where ordinary deteriorated rapidly. EVERDURE CALTITE is a integral Hydrophobic and Pore-blocking Ingredient (HPI) for inclusion in the structural concrete, which reverses capillary “wick” or sucking action, as well as providing a physical pore-blocking component when subjected to hydrostatic pressure. A high range water reducing compound, Cementaid SUPERPLASTET, is also used to reduce w/c ratio, as well as optimise workability. The result is non-absorptive and moisture-impervious, inherently dry concrete, permanently protected from water ingress, and proofed against soluble salt and acid attack. EVERDURE CALTITE has been shown to be highly effective, even in some of the world’s most severe environments. Its record of more than 50 years under conditions of extreme chloride and sulphate exposure with no significant deterioration, is unique. EVERDURE CALTITE is the extra ingredient in concrete, (in addition to cement, aggregate and water) which profoundly reduces both absorption and pressure-permeability, as well as providing corrosion inhibition over the long-term. EVERDURE CALTITE effectively replaces the need for coatings to the concrete or steel or other methods of waterproofing and durability enhancement. The Everdure Caltite System is practical and easy to use. As with all good quality concrete, we recommend careful application to the highest possible standards for best results. Refer to the Technical Specification. The EVERDURE CALTITE SYSTEM optimises basic concrete density, *** using a minimum ordinary portland cement (OPC) content of 350 kgs per cubic metre, (or 595lbs or cubic yard), and a maximum water:cement ratio of 0.45, to provide a concrete of reasonably low porosity. (For minimum OPC contents using blended cements, contact Cementaid). The EVERDURE CALTITE SYSTEM uses two specialised ingredients which modify concrete properties, to achieve truly effective watertightness and damproofing, as well as extreme corrosion resistance:-The first is SUPERPLASTET, a highly effective, slump-retaining superplasticiser, which greatly reduces the batching water requirements, thus controlling the volume of the capillary network in the concrete. SUPERPLASTET also improves the concrete’s workability, to assist placing and proper compaction.The second is Cementaid CALTITE, ** a unique liquid ** Hydrophobic and Pore-Blocking (HPI) ingredient, which is dosed at the rate of 30 litres per cubic metre of concrete. 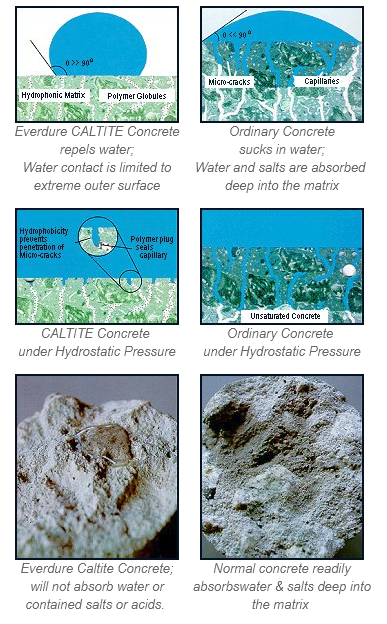 CALTITE has two distinct waterproofing actions:The first is a reaction of the hydrophobic components within Everdure Caltite, fundamentally changing the surface tension of the cement hydrates and capillary surfaces. This produces a permanently modified concrete matrix and capillary system, which is intrinsically water-repellent and non-ansorptive throughout its entire mass.In a second action, discrete polymer globules moving with the bleed water, collect in the capillaries. When the hardened concrete is subjected to water under pressure, these globules coalesce to form a physical “plug”, blocking the capillary and preventing ** further water entry.The EVERDURE CALTITE System also includes service by technical representatives of Cementaid during necessary trial mixes at the batching plant, to help ensure correct dosage and to monitor concrete quality. Acids, fertilisers etc disintegrate the cement paste. Conventional protective measures (ie surface treatments, coated rebar, pozzolanic materials and corrosion inhibitors) attempt to overcome the inherent deficiencies in ordinary concrete. However such methods themselves have certain practical limitations to their effective application and are not able to provide adequate durability in many field environments. EVERDURE CALTITE directly addresses and corrects this fundamental limitation of concrete, i.e. its porosity. EVERDURE CALTITE is a time-proven, practical system which produces effectively non-absorbent, impermeable and durable field concrete. EVERDURE CALTITE has a time-proven track record of more than 37 years of successfully protecting concrete structures against corrosion, even under the most severe conditions. A storage barn for road de-icing salt near Nottingham, U.K. was constructed using prestressed concrete panels incorporating EVERDURE CALTITE in all but two controls. The University of Liverpool is monitoring the concrete’s performance. Queen’s University of Belfast examined concretes modified with 10% and 20% silica fume and EVERDURE CALTITE using various in-situ test procedures. The results for concretes with a water/cementitious ratio of 0.4 are given in Figure 2. EVERDURE CALTITE was found to be more effective in reducing surface abrasion and permeability than silica fume, the latter by a factor of ten compared with the control. EVERDURE CALTITE gave comparable compressive strength to the control while somewhat improving tensile strength. A time-to-corrosion study was conducted in the Department of Civil Engineering on concretes with and without EVERDURE CALTITE. The specimens were cast with reinforcing bars at 10mm, 25mm and 40mm covers and cured for 7 days. These were subjected to one week ponding with 5% sodium chloride solution followed by one week drying, before reponding with salt solution and so on for 17 cycles. Potentials were measured with a “Saturated Calomel Electrode” (SCE). Results for 10mm covers are given in Figure 3. Reinforcement at 10mm and 25mm covers in the control were depassivated after 8 and 14 to 16 cycles respectively. The reinforcement in the EVERDURE CALTITE specimen, on the other hand, remained passive throughout the test. This indicating that chlorides had not been able to penetrate the cover thickness during the test period. Experiments were conducted at the National University of Singapore comparing penetrability characteristics of concrete with a water/cementitious ratio of 0.4 containing a wide range of admixtures and additives from four separate suppliers. Figure 4 summarises the pressure penetration and absorption results for silica fume, polypropylene fibre and hydrophobic concretes compared with those for the reference concretes. EVERDURE CALTITE concrete was found to have, by far, the lowest pressure penetration value obtained. The absorption tests showed only EVERDURE CALTITE profoundly reduces absorption compared with the reference concretes.